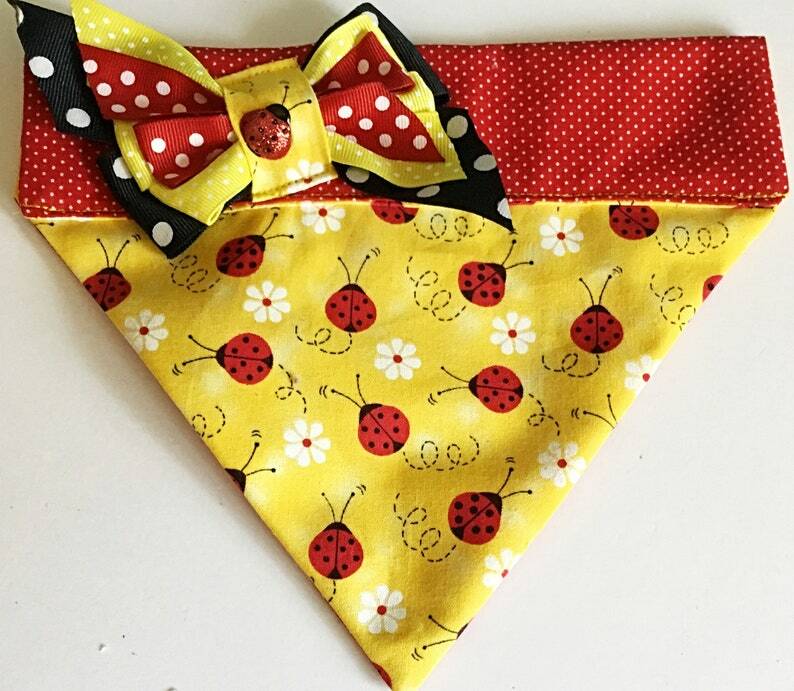 This Embroidered Ladybug Bandana is so cute for both dogs and cats.. The over the collar bandana displays a yellow background with red ladybugs and white daisies throughout. I have added a side ribbon bow and bow tie in the images to the bandana. Either option is available when ordering. The casing and reverse side are made from a red and white polka dot fabric. Solid red fabric is also available to be used for the casing and reverse side. Please add a NOTE IN THE COMMENTS SECTION TO ME WHEN ORDERING IF YOU WOULD LIKE TO SUBSTITUTE THE RED AND WHITE POLKA DOT FABRIC FOR SOLID RED FABRIC. (Center bow tie and ribbon decorations may vary in design and colors depending on stock availability and size chosen.) This bandana also comes with or without an embroidered name in the center. Please note the name in which you would like embroidered on the bandana when ordering if this option is selected. The bandana slips over the collar through the casing for easy placement and removal. WANT TO SEE MORE BANDANAS? All bandanas can be made from any fabric in my shop. I can also custom make a bandana with a fabric of your choosing. Please contact me in regards to this. Bandanas can be custom made in sizes from XXS to XL and will fit collar widths up to 1 inch. If your dogs collar is larger than 1 inch, please let me know via email so that I can make the casing larger. XXS- Cats/Toy Dogs- Fits over 3/8" to 1/2" Collar Band- Top Width- 6", Side Casing 1", Side Diagonal 4"
L- Top width from side to side,11 3/4", top casing, 2" in width, diagonal under casing to point, 8"
XL- Top width from side to side, 15", top casing, 2" in width, diagonal under casing to point, 10"
*All sizing above are approximate measurements. Hand wash only. Iron if necessary.